Needless to say, the man wanted to kill me. I tried to talk him down, explaining that I would never just joke with him like that. That I was so sorry. That obviously I would never tell him that I was pregnant via text message and that I would also never take a pregnancy test while out to eat with friends. That I should have thought it through and should never have sent that message in the first place. That I was the worst wife ever. His response, “Are you completely insane? !” And later, “Do not ever send me something like that again!” On Friday night, our marriage was on shaky ground. To all my girls out there, married or not, learn from my mistake. 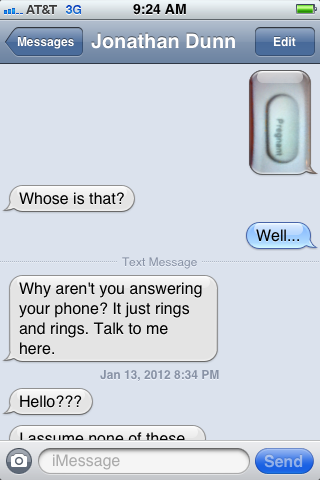 Never send your husband a text message with a picture of a positive pregnancy test on it! Or an email even, probably. Oh, technology…how you have failed me. In celebration of our amazing accomplishment we went to Outback and used a Christmas gift card to eat a large amount of Bloomin’ Onion, steak, baked potatoes and Caesar salad. Yum. (Perhaps now understanding those lingering 10 lbs…) We went home and had a relaxing, uneventful night. Sunday morning, Jonathan wakes up in horrible pain all over his stomach and back. At first we think it is food poisoning, but after a few hours we realize it’s something more than that. Eventually I take him to Urgent Care hoping they can do something for him. The man is in so much pain it is all I can do not to burst into tears, but, knowing that wouldn’t be the least bit helpful I instead make a lot of un-funny jokes. It’s something I’ve always hated about myself-that in a medical crisis I get so upset I feel the only way to keep myself from exploding with grief (not helpful) is to crack corny jokes (equally not helpful.) Eventually the doctor tells us it is either a kidney stone or the early stages of appendicitis and we go home to wait and see. Thankfully, a few hours later it becomes clear that it is not appendicitis and after drinking what seems like several gallons of fluids, Jonathan starts to feel better. We are so thankful that Jonathan is more or less back to normal with only a few residual side effects. I have heard from multiple sources that kidney stones are one of the most painful things the human body can experience. Most say it is the closest equivalent men can experience to childbirth and some women who have been through both even rank kidney stones as the more intense pain. I feel horrible that Jonathan had to go through that. But I know that one day, a few years from now, when that positive pregnancy test is mine, I will be reminding him of what this felt like. And I will probably point out the fact that he was only dealing with something smaller than a dried pea. 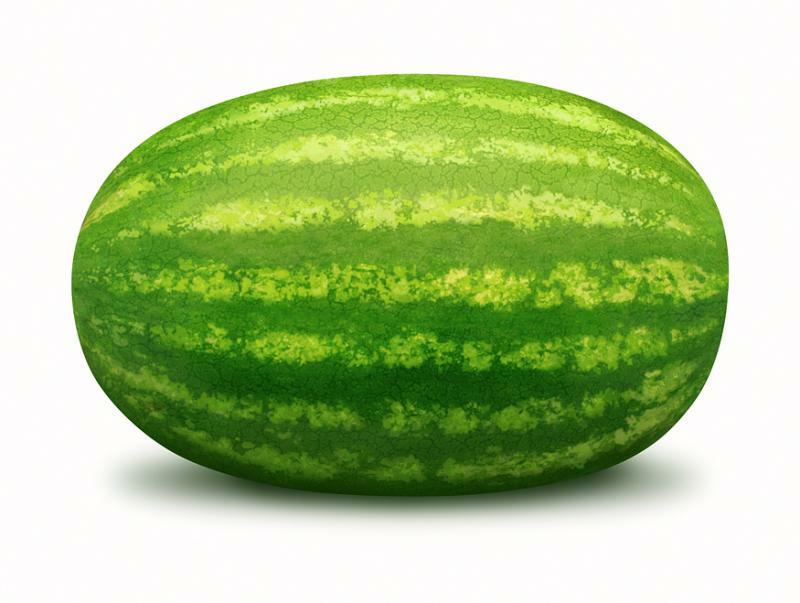 While I will be dealing with something the size of a small watermelon. But don’t worry, I probably won’t tell him any of that in a text message. 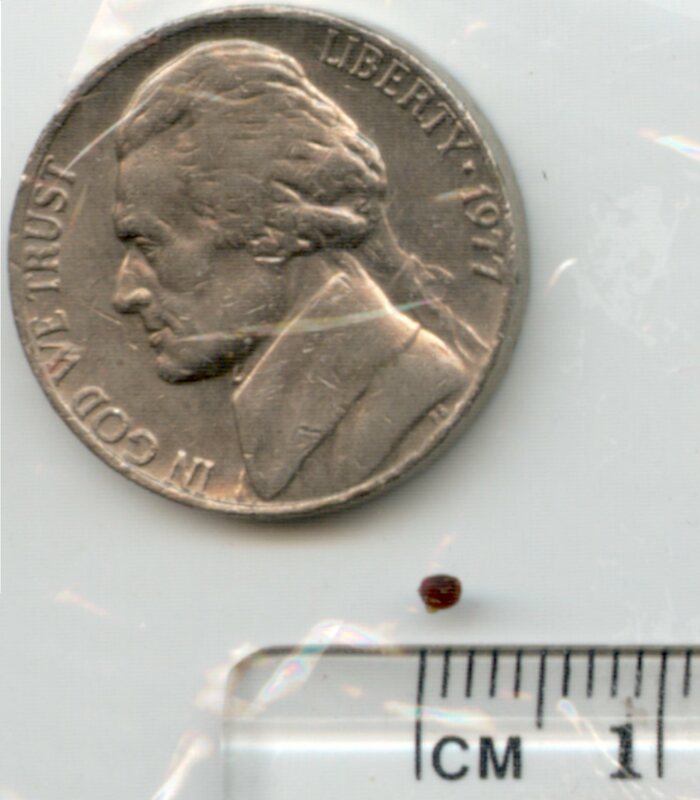 Kidney stone. Not Jonathan’s. Ew. loved this post! Awesome job on the 11 miler! woah!!! I’m so impressed! Why, thank you! We’re just like 5 1/2 weeks away from the race! I’m getting so excited! Emily…I am so glad! I love brightening people’s days! I love imagining you reading this and laughing out loud. 🙂 I will suggest to Jonathan that perhaps it was worth making that mistake for the joy it is bringing people. Haha. I love your natural, honest, and yet humorous and witty writing style! Aww…I’m blushing. Glad you found me again. I am looking forward to reading about all of your adventures in Rwanda. Loves you.